Therefore, I decided that we were going to have our fruit and salad week. One day I made tabbouleh; the other day I ate a salad with mozzarella, tuna, olives, arugula, sweet corn, and radicchio; not to mention the other day I ate a whole bowl of watermelon!! Since I had in mind to prepare a fresh salad I have never done before, I headed to the market near home and stopped at Mrs. Clara’s stand and asked her what was the freshest produce she has got. You know something? I love her name – (in English Clara means “clear” ). Whenever I’ve got something in my blurry mind – in regards to what to cook – , she “clears” it up. Going to her beautiful stand and seeing all those gorgeous vegetables, fruits, and herbs, is how I get inspired about which ingredients will go into my recipes. 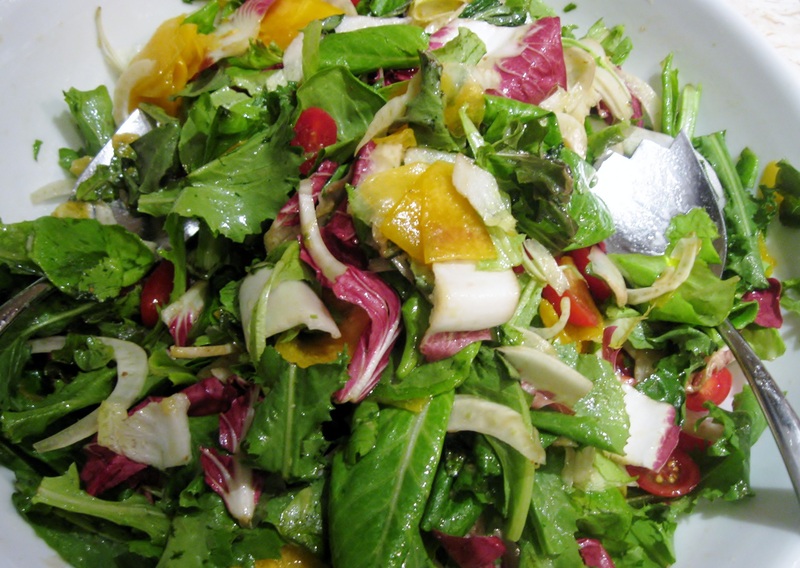 The idea behind the recipe was to prepare a salad that included not only vegetables, but fruit and lots of herbs. Slice fennel and peaches thinly. Cut tomatoes in halves. 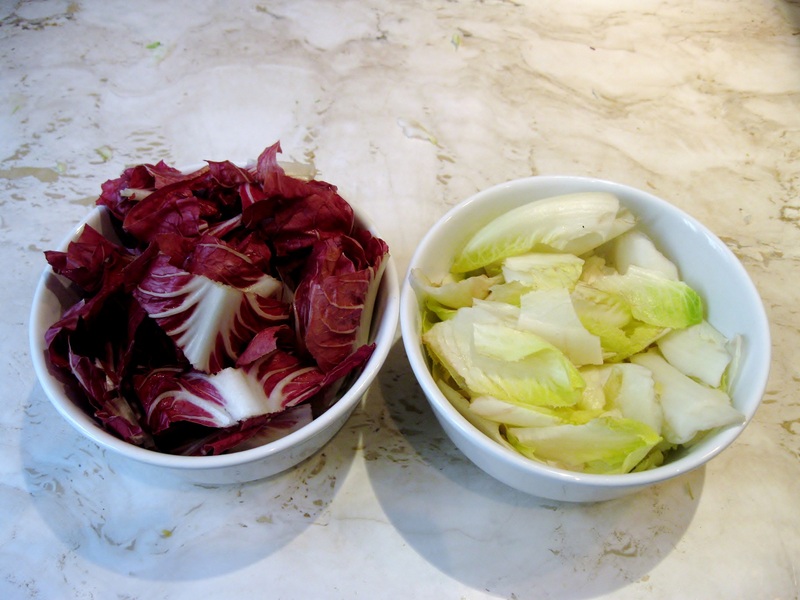 With your hands cut radicchio and Belgian endives. 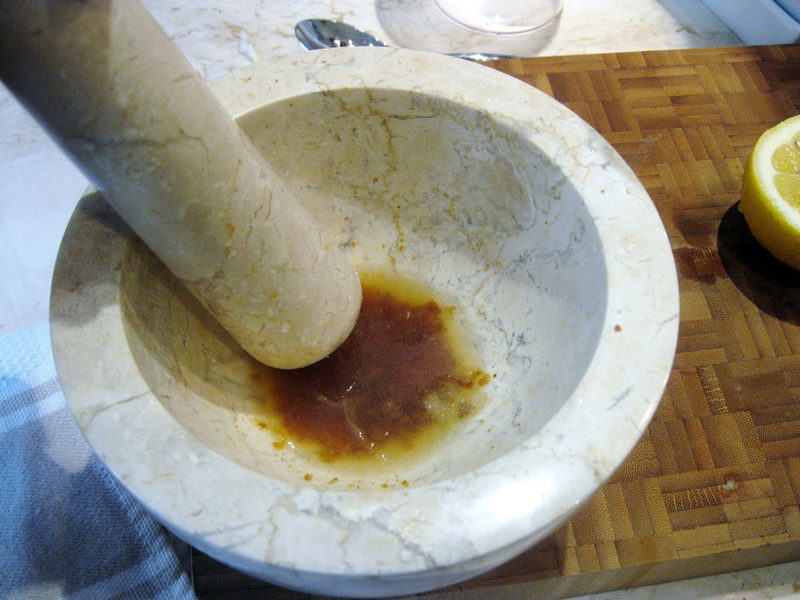 To prepare the dressing, I used a mortar and pestle which I find very useful when blending ingredients. I started with crushing brown sugar pebbles. I used rapadura sugar, which is a type of brown sugar with a caramel taste, very characteristic of some Latin American countries. 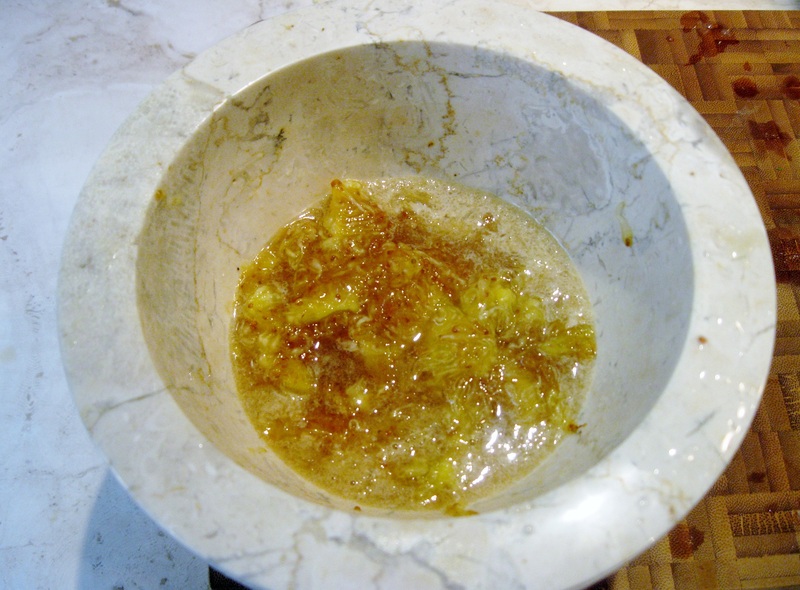 Add lemon juice and blend it with brown sugar. Cut figs in half. With the help of a spoon remove the pulp from figs and add it to the lemon – sugar mixture. Add some herbs and blend. Add extra virgin olive oil. Toss dressing over salad and add lots of fresh basil, oregano, and mint. Add salt and crushed peppercorns. 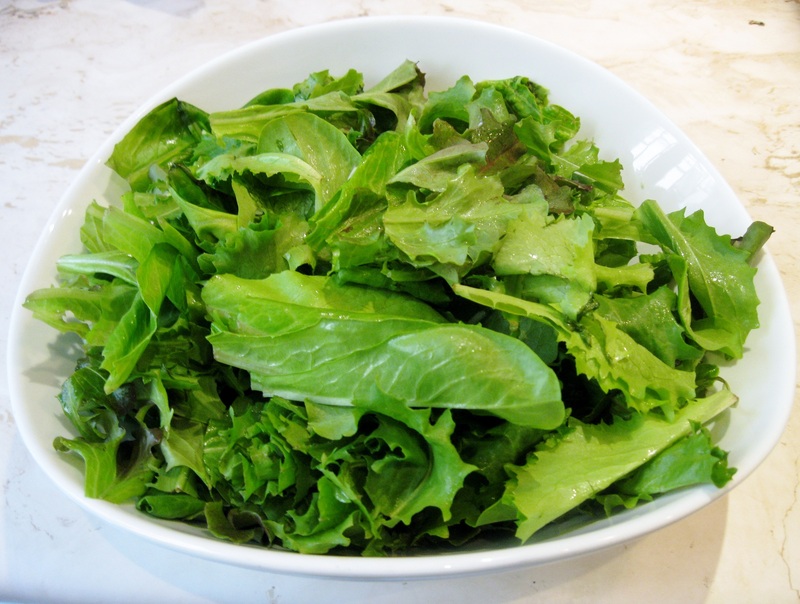 To plate the dish, put salad into a small bowl pressing down to firm it up. Place a cold serving plate upside down on top of the bowl. Holding the plate against the bowl, turn it upside down. 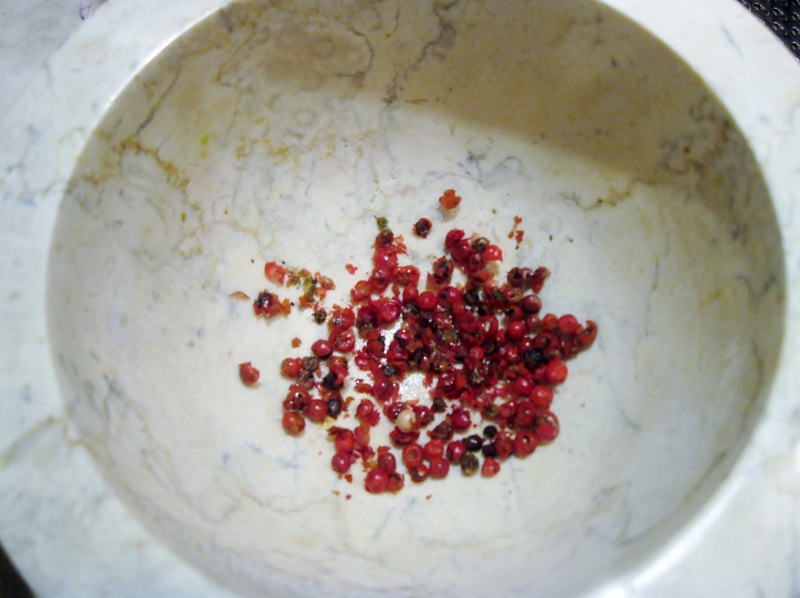 Sprinkle with some crushed red peppercorns. 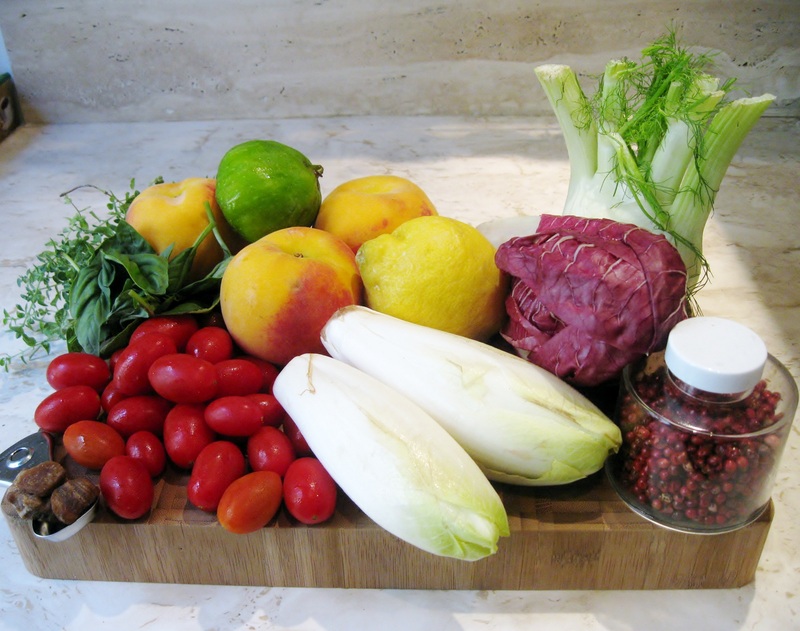 I’ll be adding this salad to my summer meals! 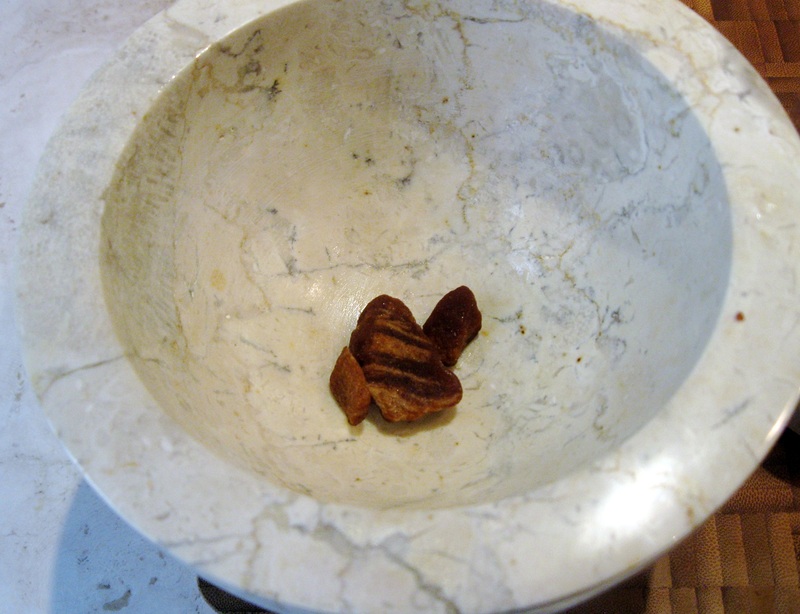 I love that you used figs in your dressing and smiled seeing the mortar and pestle as it seems so many pulse away in food processors!! Light and lovely; beautiful photos!! Have a wonderful weekend! Thank you!! 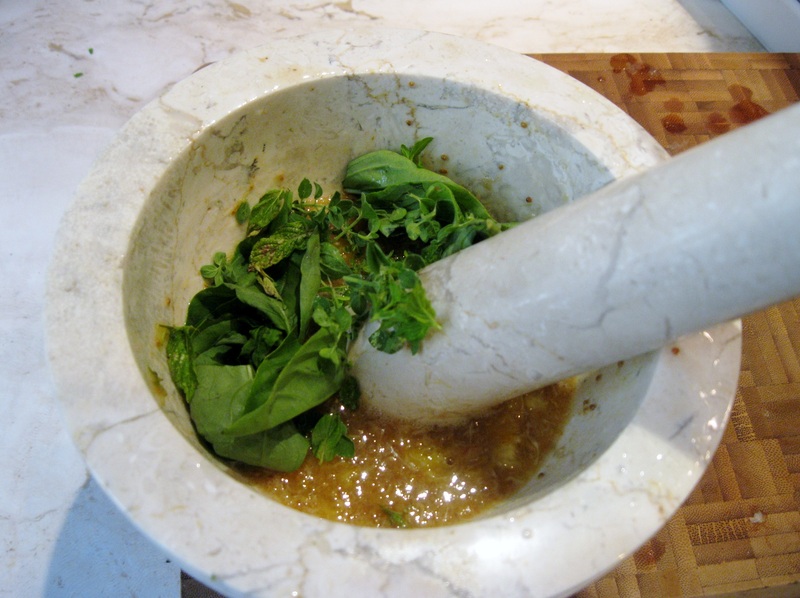 I find mortar and pestle great for sauces and dressings!!! 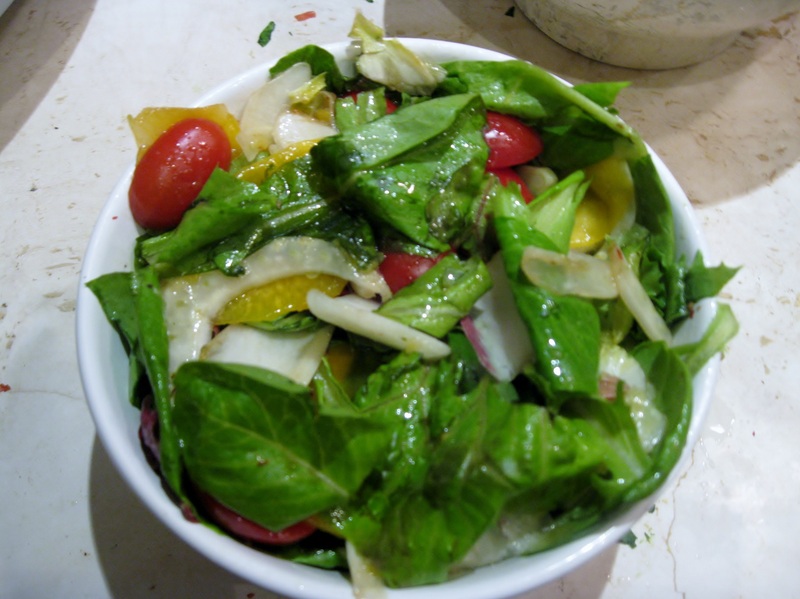 Your salad sounds so perfect and refreshing in such hot weather. The figs and sugar in the dressing must have brought out such wonderful flavors. I love the mounded presentation. Thank you! Indeed figs and brown sugar worked out perfectly, specially when paired with the tanginess of lemon!! This looks wonderful and I can relate, bet Linda can too, to the 100 degree heat. It cooled off to 92 one day and it was like a cold snap. Even with AC, cooking gets too hot. Great post! In my case it is worse!! I do not have AC neither in my kitchen nor in my living/dining room!!!!!!!!!!!!! When it’s that hot, salad is all you can eat and this is a wonderful salad. 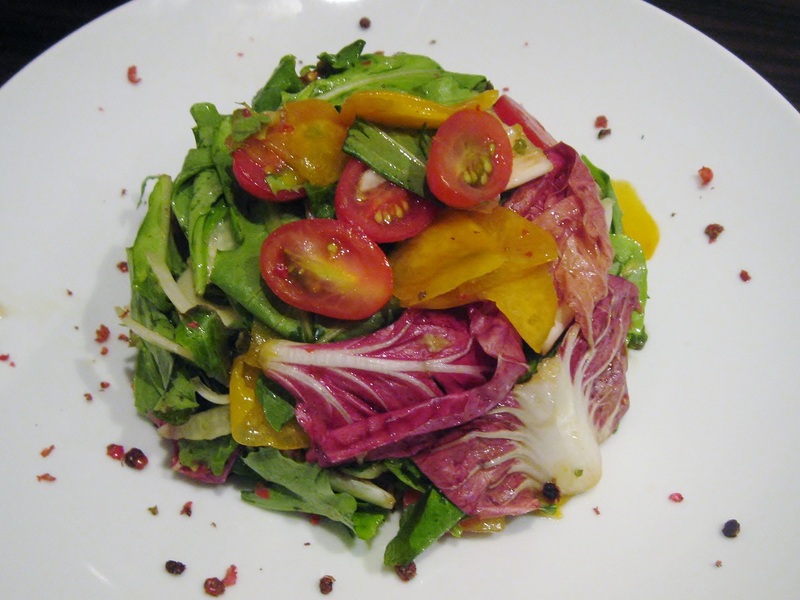 I love the idea of using figs in the dressing, and I love red pepper corns too. 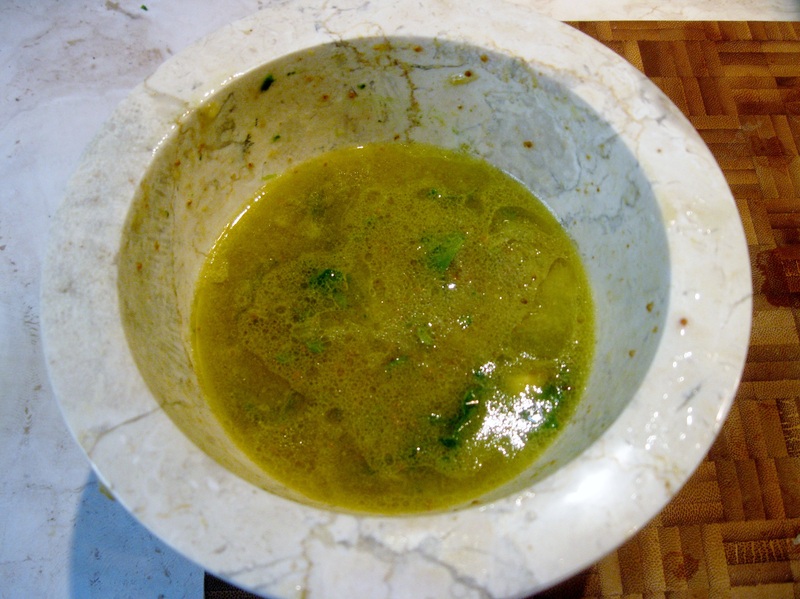 No surprises here – just another wonderful recipe with the most unusual dressing that I shall test today – although I haven’t seen any figs in our neck of the woods. I made the Parmigiana again last night! Those figs were a gift from a friend from Puglia! I thought I could use them in the salad dressing to add body and flavor! I am glad you made the Parmigiana again!! Rome is not as hot in August as it is in July! But it is still hot. I would recommend visiting Rome in September or October! What a nice way to present a salad. The dressing is very interesting and not one I have seen before. I am definitely going to have to try it out. Great! Don’t forget to add the red peppercorns!! Without them, it is not the same! I love your presentation! It looks delicious!